Find great local foods on the Hawaiian Islands - Oahu, Kauai, Maui, and the Big Island. The Hawaiian growing season lasts all year long. The varied micro-climates on each island—rainy sides and dry sides and mountains in the middle—mean that cooler, shade-loving vegetables like lettuce and heat-soaking plants like tomatoes can thrive all year long within a relatively small geographic area (of, say, an island). Add to that the range of tropical fruits that flourish on the islands and you have the makings for some delicious local eating. Learn what to expect when with this Guide to Hawaii Seasonal Produce. The islands are full of farmers markets. Find farmers markets in Hawaii, whether you're a local looking for groceries for a week or a tourist in need of a supremely ripe pineapple. If you're not local, be warned: most farmers markets in Hawaii have serious start-times for which shoppers line up and wait for the rope to drop or gate to open at which point they run in to claim the freshest lettuce and most fragrant pineapples. Most Hawaiian CSAs have staples that would be familiar to Mainlanders (carrots, green beans, spinach), except they're on offer much more of the year and are joined by tropical crops like ginger, taro, and fruits of all kinds. The best way to find a CSA in Hawaii that works for you is to ask around at farmers markets. Locals already know what's what with Hawaiian party food, but visitors may need a quick guide to what to expect at a luau. For visitors to the islands: luaus can be fun and cheesy hotel affairs but they are also an alive and vibrant local tradition and they're how many big events - birthdays, graduations, etc. - are celebrated on the islands. ​If you are lucky enough to be invited to a real luau, say yes! I predict there will be an impressive amount of food and even more aloha spirit to greet you. The purple potatoes are grown in Hawaii - slightly sweet, fluffy with starch, and an almost jewel-like purple hue - are hands-down delicious. Also known as Okinawa sweet potatoes, these tubers are highly nutritious. When cooked in coconut milk and a bit of garlic (I like to add some ginger to mine as well), they may well blow your mind. Didn't know that bananas have flowers and that they're edible? You'll find that at farmers markets in Hawaii—just peel away the tough outer layers to reveal the tender leaves inside, delicious chopped into salads, added to soups, or used in stir-frys. Learn more ​about banana flowers here. A piece of grilled fish tucked into a bun like a hamburger doesn't begin to describe how tasty fish sandwiches are in Hawaii. The best one I ever had was from an unassuming lunch truck parked under a tarp... next to a fish market. Haupia is a cross between Knox blocks Jello desserts and a creamy pudding - all with that crazy coconut flavor that is at once familiar and unlike anything else. It is a local staple, served at events big and small for dessert. Huli huli is a marinade and a cooking method. The original way of making huli huli involves turning two grills to face each other ("huli" means "turn" in Hawaiian), but most versions are made on a rotisserie or just a grill, but a live fire is always part of the equation. The marinade is a riff on teriyaki (get the recipe for huli huli marinade here) and works particularly well with chicken (get the recipe for Huli Huli Chicken here), but is delicious with pork - especially ribs - as well. These fritters made from mochi, a paste made from pounding sweet rice, fried until crispy on the outside, and dipped in sugar are amazingly chewy and toothsome on the inside. Look for them at plate lunch vendors and in Hawaiian markets. Ohi'a 'ai are crazy shiny, bright red fruits that grow in the humid areas of the Hawaiian islands. They have a taste and texture remarkably like pears and are usually eaten fresh. Find them at farmers markets and farm stands. Note that they have thin, delicate skins and thus require gentle handling. Cacao plants—from which chocolate is made—are tropical. Thus Hawaii is the only state in the union that can grow cacao and has truly local chocolate. The cacao bean used to be sent mainland for processing, but chocolate-makers who start with the beans, roast them, and render them into delicious chocolate, like ​Malie Kai Chocolates and Original Hawaiian Chocolate Factory, are popping up on the islands. Do you run an event featuring the local foods of Hawaii? One event that features one of my favorite crops of Hawaii is the Kona Coffee Cultural Festival, held every November. 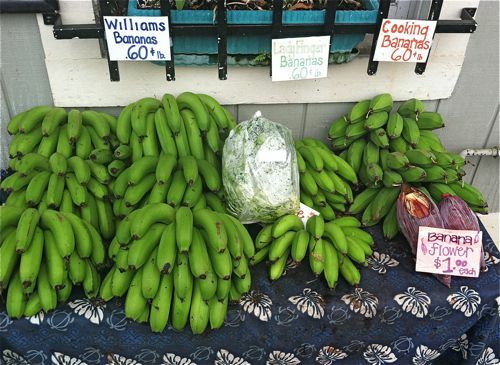 Share Your Table has recipes, resources, and stories of local foods on the Islands. Mālama Maui (to preserve Maui) was started in 2005 to highlight the cuisine, agricultural history and ag-tourism offerings of Maui Nui (the islands of Maui, Moloka'i, and Lāna'i). Following tourism, agriculture is Maui Nui's most important industry. It focuses on restaurants that source locally, locally grown products (such as coffee), and the importance of agriculture in the history of Maui.